How do I initiate Office@Hand web meetings on my computer? 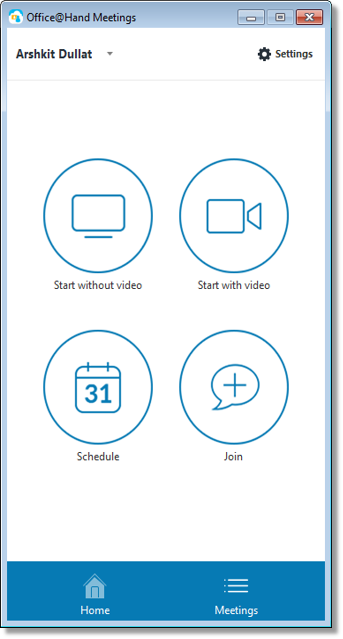 The AT&T Office@Hand Meetings allows you to host or join cloud video conferences, online meetings, as well as mobile collaboration. The meeting bridge can be used for 8 hours at a time. Note: Should the meeting last more than 8 hours, the hosts and participants will be disconnected from the meeting and will have to dial back in. Launch AT&T Office@Hand Meetings for Desktop. Click the AT&T Office@Hand icon on your desktop. Select by clicking any of the buttons on the meetings screen.